Posted on 03 February 2017. 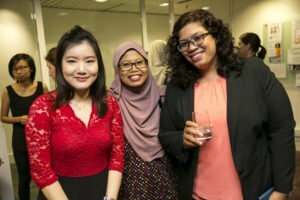 Malaysian Commonwealth alumni gathered on 29 November 2016 to welcome home recently returned Commonwealth Scholars at a reception held in Kuala Lumpur, hosted by British Council Malaysia. The event was attended by Commonwealth Scholarship Commissioner Sarah Laessig and CSC Programme Officer Vanessa Worthington, who were in Malaysia for the 8th Pan Commonwealth Forum on Distance Learning. Clare Walker, Director for Education and Society at British Council Malaysia, also attended and spoke at the event. Dato’ Dr Wazir Jahan Karim (1974 Commonwealth Scholar), Founding Director of the Women’s Development Research Centre (KANITA) at Universiti Sains Malaysia, addressed guests and shared her experiences after her award and the influence of her scholarship on her career. Recently returned graduate Vaani Muniandy (2015 Commonwealth Scholar) took the opportunity to introduce herself as the new coordinator of the first CSC alumni association in Malaysia, which Vaani plans to develop over the coming year. This initiative was well received by alumni, Vaani hopes to be in touch with many more Commonwealth Scholars and Fellows in the coming months. If you are a Commonwealth alumnus from or working in Malaysia and did not receive an invitation to event, please get in touch with the CSC to check that we have your correct email address, so that we can ensure you receive future notifications and invitations to events.